This is the ultimate drink. It’s a little bit sweet, a little bit sour, and a lot yummy. 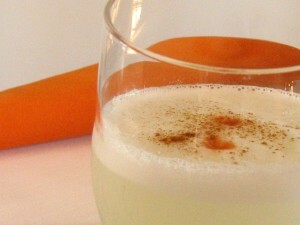 The Pisco Sour is the national drink of Peru and consists of Pisco — a liquor distilled from grapes, lime juice, egg whites, simple syrup, and angostura bitters. It’s a breeze to make and it can instantly transport you to some faraway, exotic land where delicious foods await and the party never stops (i.e. Peru). To make the simple syrup, bring the sugar and water to a slow boil, stirring until the sugar has dissolved. Remove from the heat and set aside to cool for a few minutes. To make the drink, add the lime juice and Pisco to the warm simple syrup and stir to blend the ingredients. Pour the mixture into a blender and add enough ice to double the volume of the drink. Blend on high for about 30 seconds to crush the ice. Add the egg white and blend for another minute. Pour the drink into short wine glasses or old-fashioned highball glasses (Tip: to keep the foam on top, put a spoon on the lip of the blender jar as you pour the drink into the glass to separate the foam from the rest of the drink). Add a dash of angostura bitters in the center of the foam. Sprinkle some cinnamon on top for extra pizazz. steph@nie - I sure hope you find it! This is a tasty one! Rita - Mmm… Delicious! Drinks are too comforting! I gotta find Pisco, though… I’ll search around in some shops, otherwise I’ll order it!!! Jason - Those Peruvians sure do know how to make a great drink. And, it seems like it’s usually a pre-drink drink, if you follow me. One of these gets the rest of the night started off just right… Or the afternoon, as was our case today.